Who could resist the gold pattern - so retro. 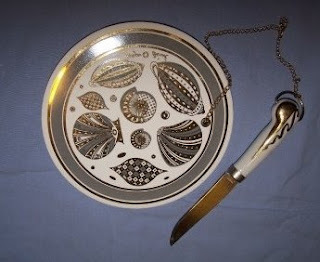 Georges Briard Seashell Cheese Plate and Knife. Seashells, appropriate for The Cool House, no? Good thing as they are both mine courtesy of ebay. and foodie taste. Didn't LH close early April? Better lock them up when Heidi's around!! Briard has popped up on my radar and I really appreciate your article. I rate him very highly.